Fair Elementary’s Second grade TAG students went on a field trip to our local Pizza Hut and animal shelter. Pizza Hut manager, Pam Oldham gave students a tour of the restaurant and explained the procedures that the employees must follow. Students were able to go into the walk-in freezer and see where supplies were stored. The students also were able to make their own pizzas that day! After the students finished eating their pizzas, they headed over to the local animal shelter. Mrs. Barbara Yarbrough gave the students a tour of the shelter. 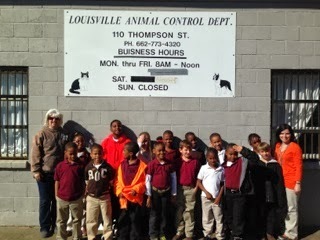 The students delivered newspapers to the animal shelter so that the animal’s cages could be kept clean. This was a part of a recycling unit and also served as a community service project.